When most people think of economics, they think of numbers — mathematical models, interest rates and financial markets. But to Carolyn Wilkins (BA ’87), economics isn’t really about numbers at all. 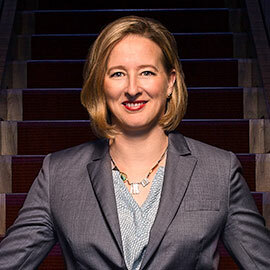 In April, Wilkins was appointed the senior deputy governor of the Bank of Canada, becoming the first woman to hold the high-profile position. In her role, Wilkins is the second-highest ranking official at the bank, serving as the right-hand to Governor Stephen Poloz. Even if they don’t realize it, the average Canadian interacts with the Bank of Canada on a daily basis. As the country’s central bank, it is responsible for issuing Canadian bank notes, but it also impacts Canadians on a much larger scale. By working with government to set economic and monetary policy, the Bank of Canada is responsible for the stability of Canada’s economy. And that’s where Wilkins comes in. Wilkins’ job description is lofty: she oversees the Bank’s strategic planning and operations, as well as shares responsibility for monetary policy. “The everyday Canadian expects to be able to go the bank and get their money, and they expect to be able to pay for things and the value of their money is preserved,” says Wilkins. “And when everything goes well, they probably don’t notice too much what the Bank of Canada is doing. As the No. 2 policymaker at the Bank, every day is different for Wilkins. She travels at least once a month, either to the Bank’s regional offices throughout Canada or around the world, representing Canada on multiple international committees. And when she is in her office in Ottawa, her days usually begin with a daily briefing on activity in the financial markets around the world, followed by meetings with government officials and policy researchers. While some eyes may glaze over at the word “policy”, Wilkins sees public policy as “the foundation of a country’s wellbeing.” To illustrate her point, she cites the 2007 financial crisis, when Canada’s sound banking and regulatory system, combined with emergency liquidity funds made available by the Bank of Canada and government actions, resulted in the nation experiencing much less financial trouble than other countries. The setting of monetary policy doesn’t happen overnight. Most policies require exhaustive research, countless hours of discussion with government and private-sector stakeholders, and mathematical modelling. It was that interest in people that drew Wilkins to economics — and Laurier — in the first place. She recalls being mentored by professors such as Pierre Siklos, Baldev Raj and Terrance Levesque, and developing a true understanding for both the financial and social impacts of economics. Raised in the small town of Selwyn, Ont., just north of Peterborough, Wilkins grew up in a neighbourhood where everyone knew everyone and friends were never far. The community atmosphere at Laurier played a big role in her decision to attend the university. She also recalls how that “small school” atmosphere helped her academically. Wilkins recalls making great friends, working at Wilf’s pub and spending a lot of time at the library, since, she says with a laugh, “In those days that was still the relevant place to go for information.” She also worked for Siklos, who is still a professor in the School of Business and Economics, manually entering census data from microfiche into a computer, “A lesson in patience and precision,” she says. Wilkins also spent two co-op terms at the Ontario Ministry of Treasury and Economics, and another working in marketing at IBM, which both came with the added thrill of living in Toronto, something that wasn’t lost on the small-town native. “I guess it would have been fun for anybody, but it was especially fun for me coming from a small town,” says Wilkins. After graduating from Laurier, Wilkins completed her MA in economics at Western University and shortly after got a job working in the Federal Department of Finance. She later moved to Canada’s Privy Council Office at the end of former prime minister Brian Mulroney’s administration, she would go on to work under two more prime ministers: Kim Campbell and Jean Chrétien. Wilkins says the early 1990s was an interesting time to break into the economic-policy field as Canada hit its debt wall and there was crisis after crisis in emerging markets. But it was a great opportunity to cut her teeth and constantly learn, something she’s still doing today. This willingness led Wilkins to her start with the Bank of Canada in 2001 and helped her move up into increasingly senior positions. Leadership, she says, is something she’s learned along the way. While Wilkins’ job certainly carries a lot of weight and responsibility, it’s important to her to find balance with her work and family life. She spends as much time as possible with her partner Victor and her 16-year-old son Samuel. She likes to unwind in the kitchen, cooking new dishes for friends and family.